Public Lab was inspired by the information blackout surrounding the 2010 BP Oil Disaster in the Gulf of Mexico. Despite having a massive impact on residents and the environment, local communities received sparse, incomplete data that contradicted what they could see unfolding in front of them. As news of the spill’s severity spread and outrage about limited access to information simmered locally, three of Public Lab’s would-be co-founders, Shannon Dosemagen, Jeff Warren and Stewart Long, convened in the Gulf Coast with a plan to use helium balloons, kites and inexpensive digital cameras to loft their own "community satellites" over the spill. The trio, in partnership with local New Orleans nonprofits and collaborators from across the United States, trained over one hundred local volunteers and activists who then collected over 100,000 aerial images of the coastline before, during, and after the oil spread. Using MapKnitter, an open source platform created by the group, residents stitched these images into high-resolution maps of the disaster. Through a partnership with Google Earth Outreach, these community-created maps were then uploaded to Google Earth making them globally accessible. The maps of the spill received broad media coverage, including being featured by the New York Times, BBC, PBS, and the Boston Globe, allowing residents to speak their truth to the world about what was going on in the Gulf Coast. The success of the grassroots mapping effort galvanized Public Lab's founders, along with other collaborators, to found Public Lab as a new research and social space for the development of low-cost tools for community based environmental monitoring and research. With early support from the John S. and James L. Knight Foundation via the Knight News Challenge, the group formally launched Public Lab as a nonprofit organization in summer 2011. Gulf Restoration Network (GRN), a wetlands watchdog group and a valuable partner of Public Lab, has repeatedly used aerial mapping tools to advocate for wetlands restoration projects and to keep community and partner organizations abreast of progress (or lack thereof). 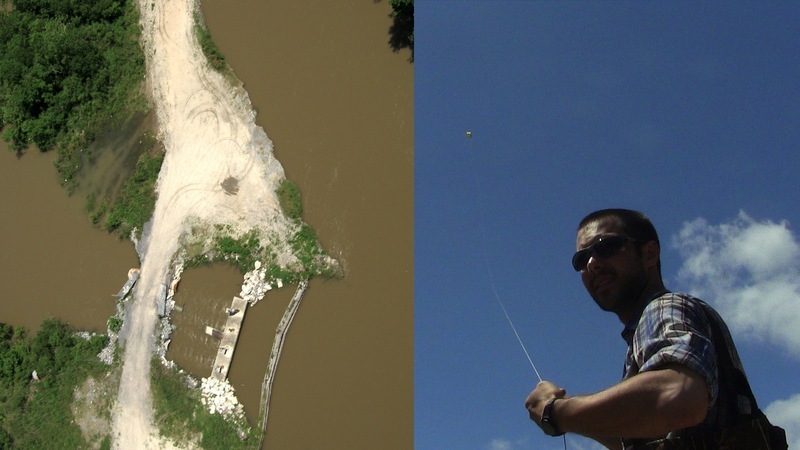 One specific instance is the use of kite photography to educate and agitate for the closure of a new branch of the Mississippi River, “Mardi Gras Pass.” If left alone, this new distributary arm would feed protective marshes and swamps with nourishing sediment and water. 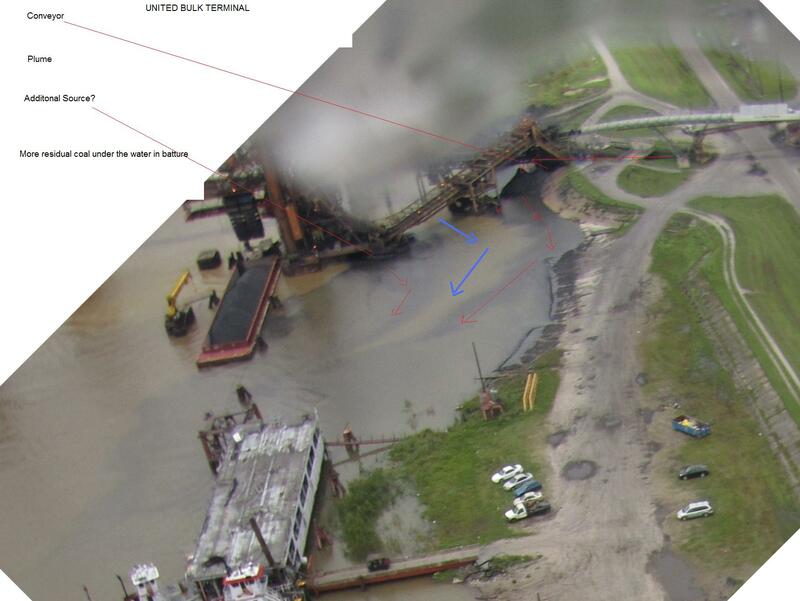 With Public Lab training, tools, and support, Public Lab organizer Scott Eustis of Gulf Restoration Network (GRN) and Devin Martin of Sierra Club successfully captured low-altitude photos of ongoing coal export dumping in the Mississippi River. The images they secured of the coal pile over time changed GRN’s understanding of the extent of Oiltanking/United Bulk’s alleged environmental crimes and led to funding for further documentation and water quality analysis of this facility, culminating in a notice of intent to sue under the Clean Water Act. Although GRN had been passively monitoring this site via aircraft, the kite photo, because of its low-altitude and oblique angle, led to a new understanding that moved Louisiana Department of Environmental Quality to do a site visit. GRN, Sierra Club, Louisiana Environmental Action, Tulane Law, and Public Citizen, have prepared to sue to improve the facility and levy fines against the company for their damages to Louisiana’s waters: they are currently in negotiations with the company. The image itself is one of a series in legal proceedings, but is more value than others taken by planes because of its level of detail. 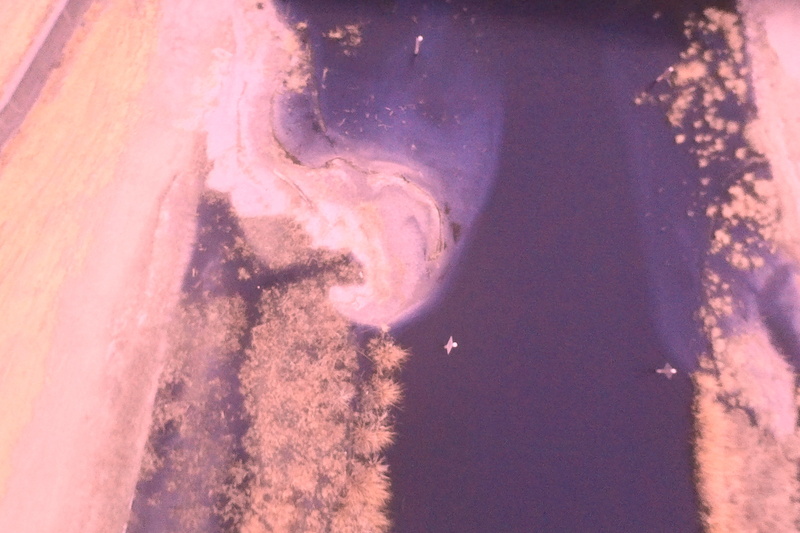 The photo is used as an organizing tool to demonstrate effective imagery for officially documenting Oiltanking’s water pollution crimes to volunteer pilots and GRN members who reside in the area. Public Lab organizer Gena Wirth and Eymund Diegel, along with Rob Holmes of the Dredge Research Collaborative, conduct aerial imaging documentation on various restoration islands in Jamaica Bay. 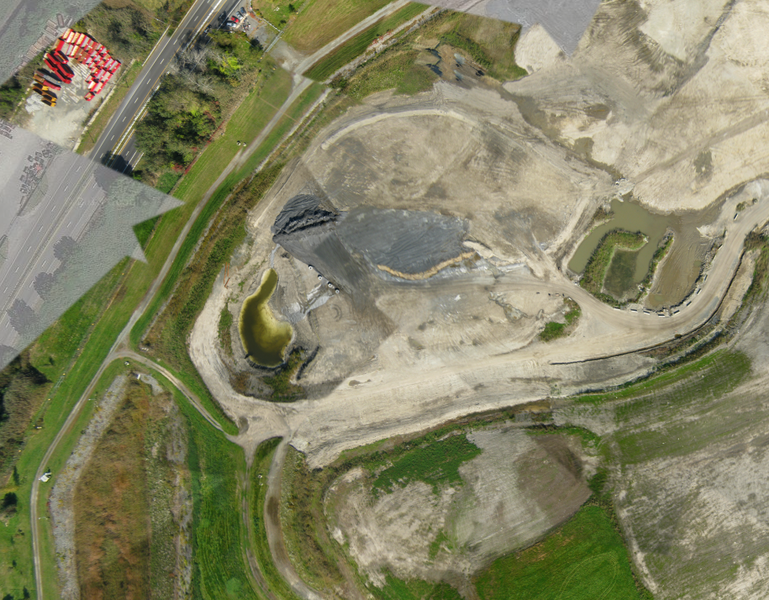 Aerial maps document progress on the Army Corps of Engineers initiative to restore eroding salt marsh habitat with recycled dredge material, show shoreline and vegetation change over time, and document citizen participation in these efforts. Jamaica Bay’s Islands are in constant transformation. For decades, Yellow Bar hummock (pictured here) has been shrinking and losing ground due to intensifying urban impacts in the Jamaica Bay watershed. This pattern recently reversed course under the direction of the Army Corps of Engineers, who use the island as a site to dispose of dredge material and as a test case for expanding ecosystems in decline. Like much of Jamaica Bay the resulting landscape is neither fully industrial or fully natural, though it retains aesthetic and performative qualities of both. The flat expanse of newly constructed ground is composed of clean sand dredged from the Ambrose Channel, the main shipping channel leading to the port of NY/NJ. Aerial maps reveal the regularized distribution of the complex marsh matrix of sediment, Spartina, and ribbed mussel, which grow together in a functional ecosystem and stabilize the marshland. Beyond the dotted fringe of cordgrass clumps our photos document the expansive island interior, touched by the Army Corps of Engineers in a more economical fashion with a grid of fences marking Spartina plug planting zones. Some mapping events have been led in partnership with the American Littoral Society and Jamaica Bay Ecowatchers. 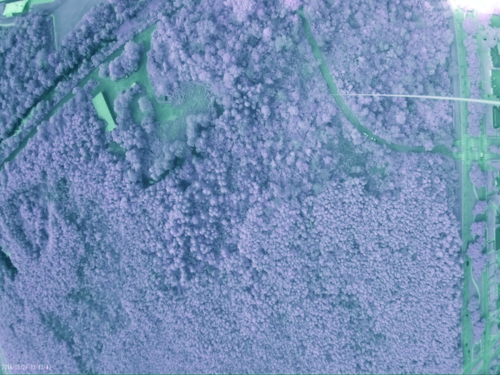 UMass Amherst, the US Fish & Wildlife Service, and Pioneer Valley Open Science monitored invasive aquatic plant removal using DIY multispectral aerial photography and balloon mapping kits. 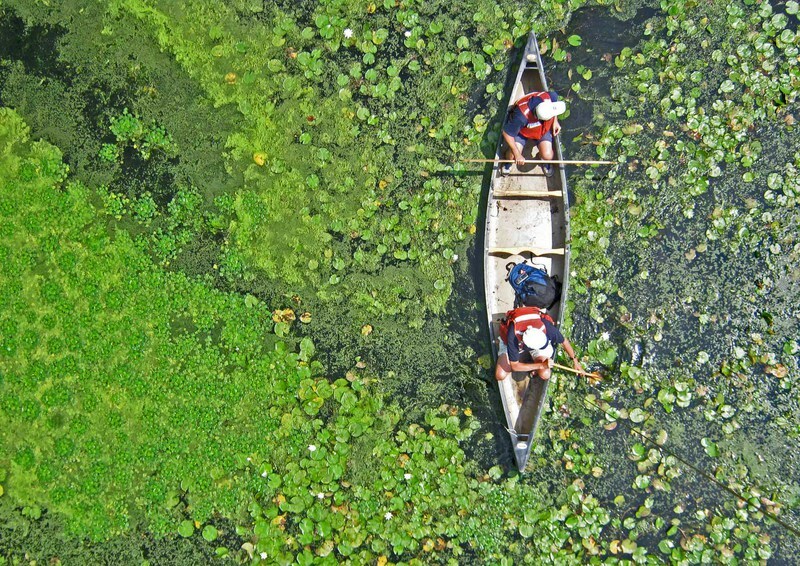 Aerial photographs of the lake effectively reveal the invasive water chestnut, as it is distinguishable by both color and texture at low altitudes. The goal is to use normal and color infrared images to locate patches of water chestnut as part of the much needed yearly monitoring to prevent the plant from spreading. Through continued technical development, Pioneer Valley Open Science is interested in automating classification of NDVI (Normalized Difference Vegetation Index) images as a “one-click” solution for citizens monitoring invasive species in their waterways. Public Lab worked on a multi-year project with Basurama.org to monitor the growth and treatment of ash at the open landfill bordering the Saugus waste incinerator, adjacent to both wetland and residential areas, with annual DIY multispectral kite photography. The project engaged residents of the Boston area in investigating local waste cycles as well as the toxicity and exposure issues related to the waste incineration process and the storage of ash. Public Lab organizer, Pat Coyle has recently worked on a 3D (Surface From Motion) reconstruction of the site using images collected from the kite photographers. Project lead Pablo Rey Mazón hopes to work towards connecting the 3D map with volume estimates that other Public Labbers are researching to compare with official data. Rey Mazón plans to replicate the project with a similar trash incinerator in Bilbao, Spain. 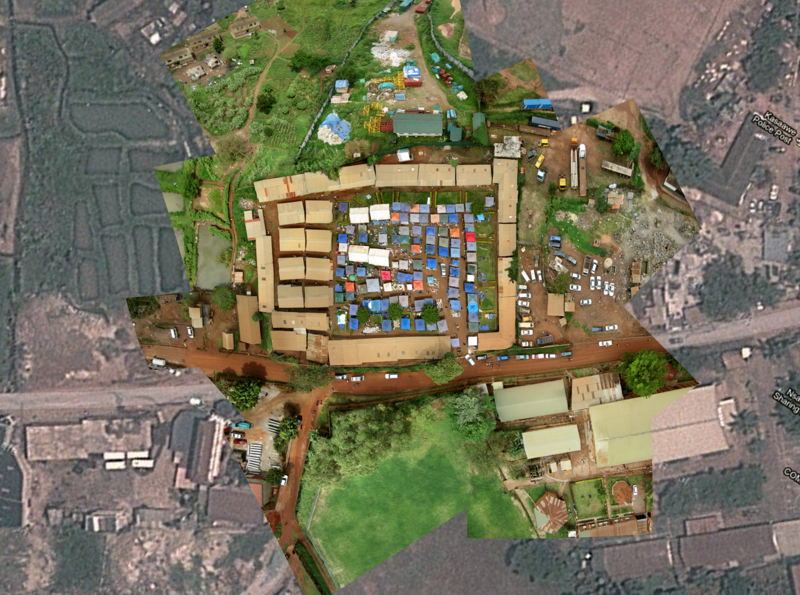 Using aerial mapping, the Craft Market near Kampala worked with María Lamadrid to combine a high resolution map of the area with community narratives. The goal was to gain time so the community could organize next steps and create a dialogue around urban planning and displacement. The Craft Market was able to legally stall their eviction for a month by using the map to acquire a court injunction from local authorities. They also interfaced with the Ministry of Tourism via the map they created, demonstrating their value to the tourism industry. The Ministry of Tourism sent a team to evaluate the Market and tried to advocate to the Ministry of Land on behalf of the Market. In the end, the Ministry of Land went through with evicting the community. The Craft Market decided to do a second map to record the progress of clearing and to document the lack of support during the eviction, demonstrating how the eviction displaced the previously flourishing market to a side street. Using this map, the Craft Market is still in the process of advocating their case. View the map here: https://mapknitter.org/map/view/juakali. 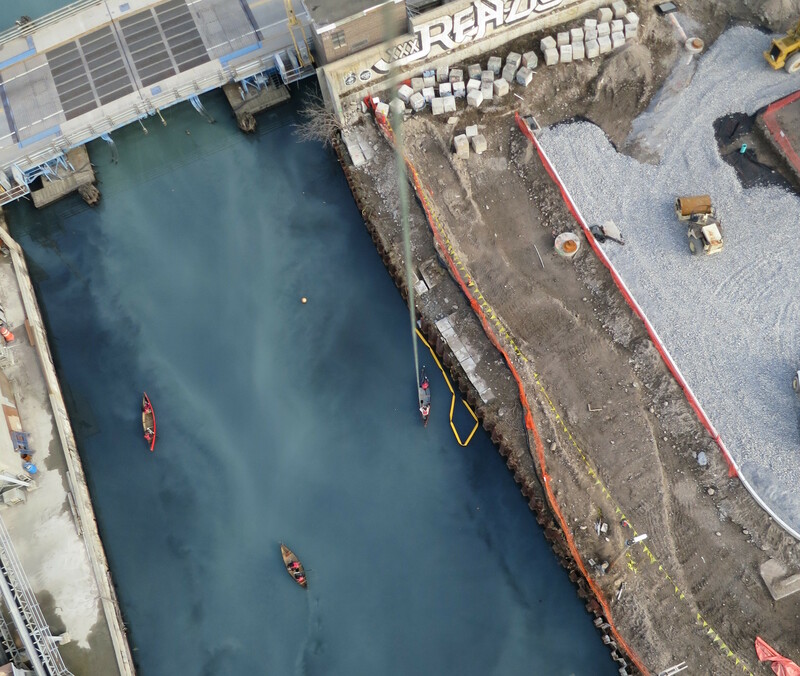 Public Labbers are working with the Gowanus Canal Conservancy and Proteus Gowanus to conduct environmental investigations in the Gowanus Canal Superfund Site and broader watershed using aerial imagery. There are three distinct goals within GLAM: 1) researching biodiversity to better manage the urban ecosystem; 2) conducting eco-detective work to improve the government’s Superfund clean-up plan; and 3) advocating for watershed health by identifying upland sites that can be used for storm water absorption to reduce downhill sewage overflow events into the canal. GLAM has succeeded in improving the Superfund clean-up plan: diligent investigation led to the discovery of an unknown freshwater inflow in the Gowanus First Street Basin, and their presentation to the EPA’s Community Advisory Group was so effective that Superfund restoration expanded an additional city block. Through vigilant aerial surveying, despite ice and blazing sun, the subsequent analysis identified four active pipes and inflows that the EPA’s survey missed which is leading to other improvements in the clean-up plan. Other independent research projects of the Gowanus have uncovered what appear to be historical Revolutionary War burial grounds which have since led to partnerships with the Brooklyn Preservation Council and the local Veterans Affairs chapter, as well as support from the Governor of Maryland and coverage in the NY Times. Public Lab is part of a multi-year project to document and quantify cover crop soil treatment and silvopasture trials using infrared photography and aerial mapping. This is part of a broader effort to develop data-driven analysis tools to support small-scale organic farmers, and is being pursued in partnership with Green Start, Farm Hack, Pioneer Valley Open Science, and the sustainable agriculture program at the University of New Hampshire. Through this work, collaborating farmers have gained a better understanding of the health of their crops as well as a greater capacity for regularly comparing crop health at low cost. In addition to providing a compelling case study and proof of concept for the tools that are being developed through this work, the research has produced new insights and initiated new projects— such as more affordable and robust single-camera multispectral imaging that forms the basis of the Public Lab Infragram program. Testing at a Boston-area meet up helped to refine “do-it-yourself” methodologies for identifying different contaminant oils— ranging from motor oil to tar balls washed ashore after a crude oil spill. Attendees to the event, hosted by the neighborhood education group Parts & Crafts, included local residents, as well as members of the Mystic River Watershed Association and Pioneer Valley Open Science. The prototype testing involved a new technique for distinguishing oil samples via florescence using an inexpensive blue laser pointer. The tests were promising, and the technique appears robust: showing similar fluorescence curves despite slight variations in sample preparation. These were included in our alpha-stage prototype oil contamination test kit and continue to be developed. These methods show great promise, and will likely be included in our prototype oil contamination test kit. Follow progress on the oil testing kit here: publiclab.org/tag/oil-testing-kit. Local residents and Northeastern University faculty used kite mapping kits to monitor a metal recycling center for code violations and contamination. This is a long, complex investigation involving legal battles. A neighborhood in East Providence, RI adjacent to a large construction waste-grinding business has noted toxic dust from the plant filtering into homes and yards. Many in the neighborhood suffer from respiratory and other health problems thought to be associated with the dust. Neighborhood activists managed (with Toxic Action Center’s help) to have the waste grinding stopped. However, the same business owner re-opened the plant as a scrap metal processing operation, but with a permit that allows for limited operations for under fifteen tons of wood products. 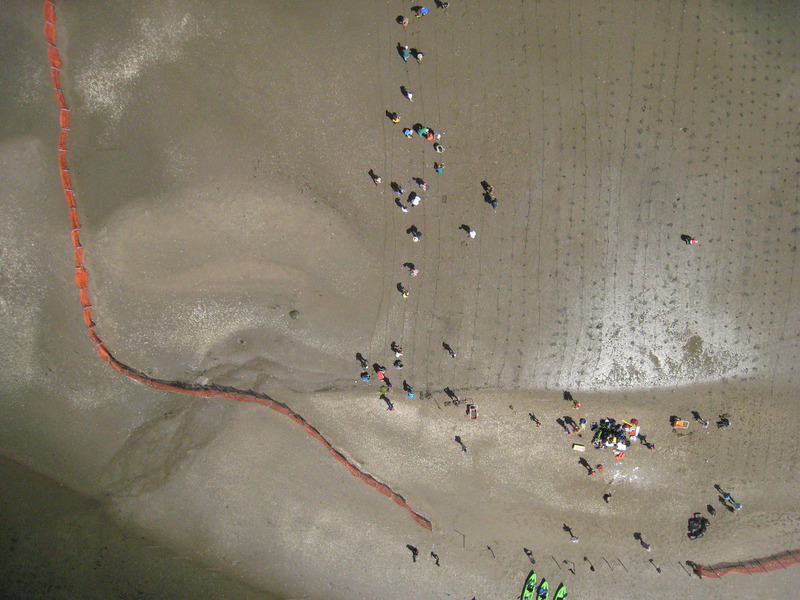 After the waste grinding stopped, balloon mapping was organized in March 2013 to document whether there was unpermitted processing of materials other than wood. Advocates have added detailed annotations to their aerial imagery to communicate the issues on the ground and attempt to convince authorities to take action to determine whether the plant is in fact processing materials beyond wood. Using images collected via kite mapping, organizers are challenging the lack of a permit for new construction of a waste storage facility at the Pilgrim Nuclear Power Station. To date, two aerial imaging trips led by Cape Cod Bay Watch have given local residents the ability to keep themselves informed about the progress of the construction, in addition to generating images and a compelling story which has resulted in press coverage (WBUR Boston-NPR) of their monitoring and advocacy efforts. Aerial imagery is useful in planning and monitoring ecosystem restoration projects. The Lake Pontchartrain Basin Foundation has developed and implemented wetlands restoration programs throughout the Lake Pontchartrain watershed, including a marsh-creation project in Bayou St John spearheaded by wetland biologist Andy Baker. Andy and colleague Scott Eustis have used Public Lab kite mapping kits to collect a long-term time series of aerial images along Bayou St John, first to determine the appropriate scale of restoration, and then to observe plant growth and channel migration, and highlight potential problems. Aerial images documented the migration of excess dredged material into the new marsh area, and the effectiveness of corrective measures. The time-series of aerial images has demonstrated differential growth patterns along the two shores of the bayou, which has implications for future restoration programs. Invasive species management programs need to have detailed knowledge of the geographic extent of a species establishment, and need to elucidate how the species expanded to that zone, and gather information to predict where the species might potentially expand. Reconnaissance to collect this geographic information often involves time- and labor-intensive work by persons on the ground or water surveying. High resolution, low-altitude aerial mapping can provide a faster and more comprehensive method of providing plant-level, landscape-scale data. 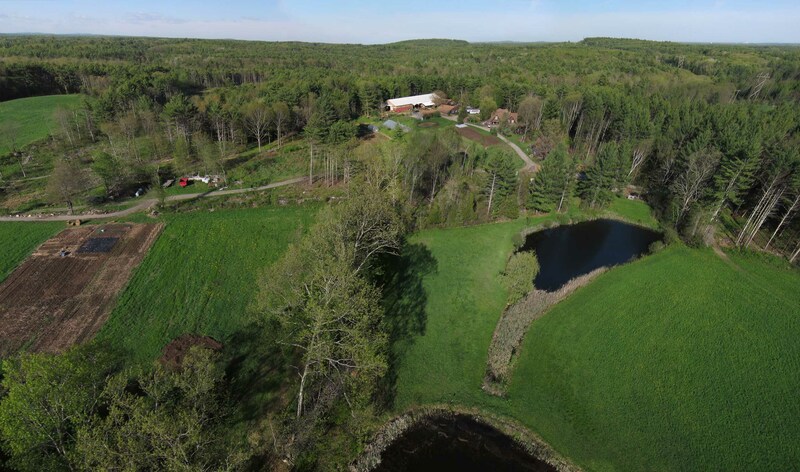 A collaboration between University of Massachusetts at Amherst professor Charlie Schweik and personnel at Fish & Wildlife Services developed a plan to use aerial images to map invasive water chestnuts in a series of ponds in Westfield, Massachusetts, which had previously been painstakingly canvassed by personnel in canoes. The UMass contingent had some initial experience with the Public Lab aerial balloon mapping kit and a camera platform developed by Chris Fastie, and had remote sensing experience. The Fish & Wildlife Services crew had local knowledge and familiarity with the river and lake network, had canoes, and the ability to identify the water chestnut invasive plant. Both teams were all eager to use this opportunity to engage UMass students in hands-on open science through two classes: (1) an Introductory Geographic Information Systems class and (2) a class on Open Science and ‘Making.’ The team used Public Lab Balloon Mapping Kits outfitted with two cameras - collecting red, green, blue, and infrared bands - flying balloons from the shoreline and from a canoe. The team planned to use Supervised Classification of the image pixels using all four bands (R, G, B, and IR) in order to discern water chestnut plants from surrounding vegetation. This particular mapping campaign was impinged by weather conditions and an unfortunate wind that dunked of one of the cameras into the water, resulting in an incomplete dataset for the project in the time allotted. However, the strategy is promising and could be employed in other settings. 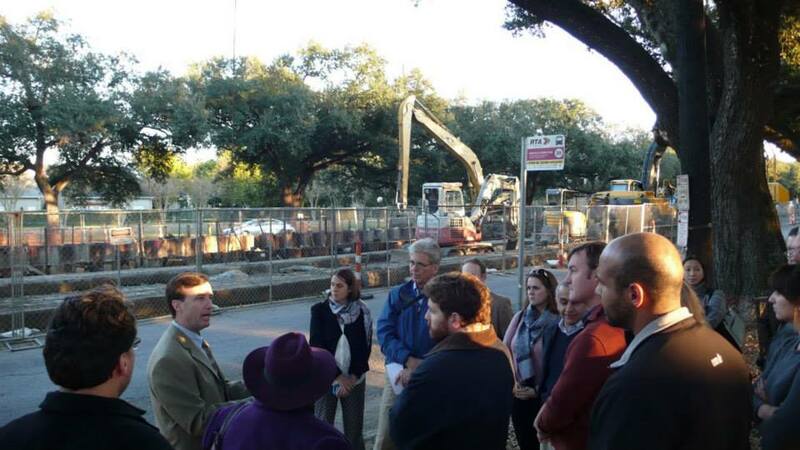 To promote and facilitate the implementation of the Greater New Orleans Urban Water Plan, a multidisciplinary and multifaceted network was created: the Greater New Orleans Water Collaborative. With more than 100 individual, community, and organizational members -- including the founding organizations of Global Green, Waggonner & Ball, the Gulf Restoration Network, Urban Conservancy, Water Works, and Committee for a Better New Orleans -- the Water Collaborative convened to coordinate and advocate for improved regional water management. The Collaborative is led by a Steering Committee and activities are driven by Working Groups in the areas of Builders & Designers, Community Education, K-12 Education, Research & Policy, Advocacy, and Communication. Working groups engage community members and City Council members in tangible, contextual walk-and-learn sessions showing various aspects of the city’s stormwater management system, and other activities. City Council members are approached on an individual level and invited to participate in activities and partner on policy work. With a diverse base, the Working Groups can appeal to the various interests and backgrounds of different municipal officials and authorities. Miriam Belblidia, CEO of Water Works, Certified Floodplain Manager, and a founding Steering Committee member of the Water Collaborative, has found that many city officials are receptive to data such as aerial maps because it brings them new and relevant information. Belblidia has also found that officials are receptive to information about actions and strategies that have been successful in other cities facing similar concerns. For New Orleans, several Collaborative relationships were built between architects and planners in New Orleans and in The Netherlands, which also has cities below sea level and faces significant flood risk. Economic arguments can be powerful too, but also can be difficult to navigate. In the case of the Urban Water Plan, the overarching goal is to reduce flood risk, which required upfront investment in infrastructure improvements. Building that appropriate infrastructure (such as building freeboard) was highly incentivized by the reduction in flood insurance costs through the Community Rating System, and became a useful economic argument to bring together various city agencies for sustainable development to achieve risk-reduction goals, with a very quick return-on-investment. If there is a clear economic incentive to the work being promoted, that is often of interest to decision-makers and tax-payers alike. While economic incentives are important, arguably the most important feature in any advocacy is the ability to organize, mobilize, and activate grassroots community members. Effective urban planners and architects, such as Waggonner & Ball Architects in New Orleans, can utilize aerial imagery to assess the landscape, identifying sites that could be useful for water management, ecological and urban development. Google Earth and ArcGIS can provide basic aerial imagery, and personally collected aerial photographs (using drones, or potentially using kite or balloon mapping kits) can provide up-to-the-minute current imagery. Current aerial images can be especially useful to urban planners after events such as major storms in order to assess the extent of flooding, identify problem areas, and ground-truth LIDAR data and stormwater modeling, providing empirical evidence to help improve models. Additionally, remote-controlled cameras on unmanned aircrafts can provide aerial imagery at a variety of altitudes and view angles. Both planimetric and oblique aerial photos are useful as underlays for design drawings, particularly with oblique views helping convey three-dimensionality through two-dimensional photos and drawings. 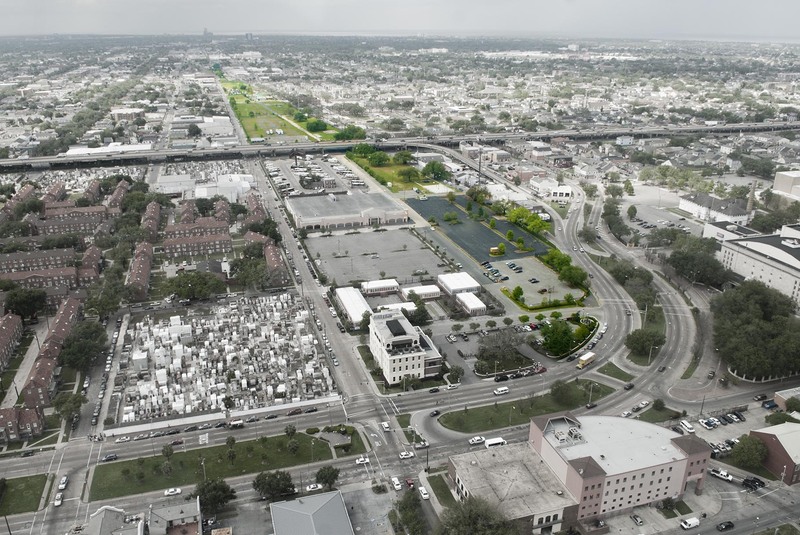 Several aerial images that have been used by Waggonner & Ball in their design process, including the Greater New Orleans Urban Water Plan, are posted on their website, http://www.wbarchitects.com. To develop water management solutions and provide a framework for a resilient and sustainable New Orleans region, Waggonner & Ball Architects and colleagues developed the Greater New Orleans Urban Water Plan. To ignite and evolve the plan, Waggonner & Ball created a network of international water management experts and prompted dialogue, known as the Dutch Dialogues, between engineers, hydrologists, architects, government representatives, economic developers, and more. They hosted a design charrette with other experts on water infiltration and inundation, where participants annotated aerial maps with proposed structures and infrastructure. The design elements that emerged during the Dutch Dialogues were developed into the Plan. The Greater New Orleans Urban Water Plan works with Louisiana’s 2012 Coastal Master Plan, but creates a system that values and utilizes water, while providing enhanced risk reduction and storm resiliency. An important aspect of the Plan is the recognition that water does not conform to political boundaries, so the Greater New Orleans Urban Water Plan addresses the appropriate region and scale, and will be implemented across municipal lines. The Plan is publically available at livingwithwater.com. By bringing together people with a range of expertise, collaborating on a dynamic design, and focusing on the hydrologically appropriate scale, and providing plan implementation strategies, the Greater New Orleans Urban Water Plan is working to improve quality of life and build a resilient New Orleans. 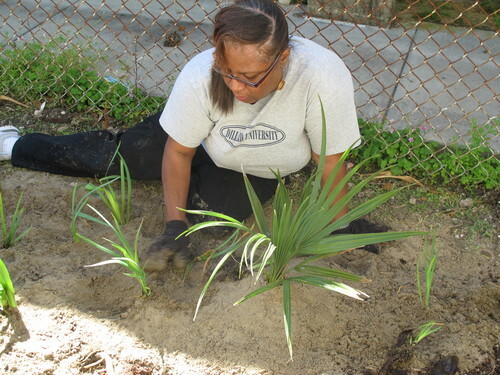 At the New Orleans office of Global Green USA, staff are working with communities with the goal of building support for green infrastructure in the most at-risk communities. Their Water Wise program is both a community education program and a direct action program, where Global Green leads workshops in people’s neighborhoods at times and locations that are accessible to community members. The workshops focus on issues that directly impact each neighborhood, such as flooding or stormwater runoff, rather than focusing on more conceptual matters like climate change; the goal of the workshops is to provide tangible education. They also have community-engaged workshops centered around immediate do-it-yourself action such as rain barrel construction and rain garden design. Community members take the opportunity to have agency in their own solution, in addition to strengthening community ties. Another community education initiative was launched by the Environmental Sustainability Working Group of the Equity Caucus, in collaboration with the Foundation for Louisiana, led by Global Green staff member Jeff Supak. Community surveys showed the need and desire for education around flooding and stormwater issues, and the need for documentation of events to provide more visibility to issues marginalized communities are facing. Residents were asked to take pictures of flooding events on their block to provide compelling evidence for the need for infrastructure improvements. As this work continues, community-collected aerial images would also be useful to provide a wider perspective in concert with on-the-ground flooding documentation, enabling communities and municipal authorities to visualize geographic relationships between areas experiencing flooding, and address the network of issues effectively. At the Audubon Louisiana Nature Center, Disaster Recovery Coordinator Amy LeGaux uses a two-pronged approach to education and advocacy around climate change and wetlands restoration. Engaging local community members and school children, LeGaux educates with pictures and data that are relevant to South Louisiana specifically, such as local flooding and ingrowth of invasive species. However, in order to grow support to leverage national pressure on an environmentally regressive state legislature, LeGaux emphasizes the importance of Louisiana wetlands to the whole country. Over 30% of the nation’s oil and gas industry and 30% of the nation’s shell fish come from the Gulf of Mexico, and are distributed through the United States’ largest port, in Louisiana. Working with local and national groups, LeGaux utilizes aerial maps to demonstrate wetlands loss over time, starting with a map from 1932 made by the United States Geological Survey. Using maps, LeGaux is able to demonstrate the magnitude of loss on a regional scale. Gowanus Canal in Brooklyn, New York has been an industrial hub since the nineteenth century. Historically, canal frontage has been used for coal yards, ship yards, dry docks, manufactured gas plants, and a variety of other industrial activities . Due to historic and ongoing industrial contamination and sewage overflows, the U.S. Environmental Protection Agency declared the Gowanus Canal a Superfund site in March 2010 . In addition to direct industrial discharges and raw sewage, stormwater runoff constitutes a significant ongoing source of contamination to Gowanus Canal, transporting metals, industrial chemicals, oils, and sediments from industrial surface yards into the Gowanus. Riverkeeper is a member-supported watchdog organization dedicated to protecting the Hudson River, and is one of New York’s foremost clean water advocates. Riverkeeper’s boat captain John Lipscomb, and his assistant Neale Gulley, routinely patrol the Gowanus Canal to document environmental conditions and spot polluters, and Riverkeeper also maintains a hotline and website for R the public to report pollution . When Riverkeeper identifies pollution problems in New York City waters, they often work with Super Law Group, LLC, an environmental law firm with deep expertise in the Clean Water Act that specializes in representing individual citizens and non-profit groups . In 2012, following boat patrols and public complaints about stormwater pollution in the Gowanus Canal, a team of researchers and lawyers from Riverkeeper and Super Law Group launched a deeper investigation of local sources of stormwater pollution. The team used a combination of Google Maps and the New York City Digital Tax Map to obtain basic information about industrial companies along the canal, but they needed higher resolution images to provide information about actual operations. During an internet search, one member of the team, Edan Rotenberg of Super Law Group, was intrigued to discover infrared images of the Gowanus Canal, captured using a balloon-rigged infrared camera, posted on the Public Lab website . Edan contacted Public Lab’s Director of Community Development, Liz Barry, who connected Edan with Eymund Diegel. Eymund is a lead community researcher on the Gowanus Canal, working with Proteus Gowanus and the Gowanus Canal Conservancy, and serves on the Board of Directors of Public Lab. The Gowanus Canal Conservancy and Public Lab collaborate on a project called Gowanus Low Altitude Mapping (GLAM) . Through GLAM, Eymund and other community members have taken hundreds of high-resolution aerial photographs using balloon and kite cameras. Eymund shared these photographs with Edan. Riverkeeper and Super Law Group sorted the GLAM aerial photographs, looking for clear photographs of industrial plots on the shoreline. In the low-altitude shoreline photographs, the team looked for evidence of faulty equipment or practices that broke permit regulations, such as broken fences that allowed debris to enter the canal, unauthorized open pits, and direct runoff from impermeable paved surfaces into the canal. In a few instances, Riverkeeper and Super Law Group approached companies that were implicated in the GLAM photographs and the companies responded by voluntarily cleaning up their operations without a lawsuit being filed. In another instance, Edan actually showed a company the images captured by GLAM, which pressured the company into compliance. In other cases, Riverkeeper and Super Law Group filed suit against the polluters, and used Public Lab community-collected aerial images to demonstrate that there was clear proof of pollution, which helped Riverkeeper reach settlements with those polluters that terminated the lawsuits quickly and brought those companies into prompt compliance with pollution laws. While the Public Lab images were useful to this enforcement effort, there are additional features and collection strategies that would improve the utility of Public Lab aerial images for people interested in initiating similar efforts. A key feature to develop or include would be the automatic logging of date, time, location, and photographer in order to create an automatic start to the chain of custody for the image. The auto-logged location also would enable a person to utilize Public Lab images in other geospatial platforms, such as three-dimensional Geographic Information System (GIS) programs. Possibly the most noteworthy way to improve the utility of Public Lab images, based on Super Law Group’s experience, is to take more frequent images, creating a time series over the course of days, weeks, and months. Time series images are useful for legal proceedings to demonstrate consistent or repeated behaviors, or to demonstrate the progression of a problem. Thermal imagery is also extremely useful for detecting errant water inflows into a larger waterbody, including both stormwater runoff and groundwater discharges from seeps or pipes. These inflows can be difficult to discern with standard photography but often are a different temperature from the receiving water and therefore are distinguishable in thermal images. Near-infrared images can also be useful in identifying different source waters by imaging different algal communities. It was the GLAM infrared imagery that first attracted Edan to Public Lab resources, and he had hoped there would be a more extensive repository of infrared (and thermal) images. Edan postulates that environmental advocates and researchers nationwide would benefit tremendously from easier access to time-series visual and thermal aerial imagery. Aerial photographs provide stakeholders and legislative decision-makers with compelling visual evidence. Aerial images can demonstrate the wide range of potential contamination pathways into a waterbody, and also remind people of the connectivity of the watershed. Thus, low-altitude high-resolution aerial images may be useful in promoting better environmental regulations and outcomes. Documentation of space, and human occupation of space, can be instrumental in elucidating land usage and concomitant social constructs and power dynamics. Mapping can provide a visual platform to reimagine those uses and dynamics. At Bourj Al Shamali Refugee Camp, understanding the current use of space and envisioning future green spaces amidst dense urban dwellings are driving motivations for creating aerial maps of the camp. In 2015, Claudia Martinez Mansell and community members of the Bourj Al Shamali camp in southern Lebanon used Public Lab kite and balloon mapping kits with standard digital cameras (red-green-blue, RGB) to take aerial photographs and stitch the images together using Photoshop, to produce the first aerial map of Bourj Al Shamali, nearly 70 years after the camp was originally established. The Bourj Al Shamali Refugee Camp in southern Lebanon was created in 1948 for Palestinian refugees after the creation of the State of Israel, and was intended as a temporary relocation space. The families that populated the camp mostly came from agricultural regions in northern Palestine (now Israel), but the next generations of those families, who still live in the refugee camp nearly 70 years hence, have lost their agrarian community identity and become urban poor. The 20,000-person camp is a densely populated urban environment, now with five times as many inhabitants as when it was first established, with very little open or green space. For historical cultural connectivity, health, and sustainability, community members are advocating for the camp’s first public green space and promoting an urban agriculture pilot initiative, and have launched a new website, www.bourjalshamali.org as part of this initiative. In order to design useful green spaces, residents first need to assess the current land uses and visualize current and potential open spaces. Geographic visualization was the impetus for community members working with the non-governmental organization Al Houla Association, and long-time colleague Claudia Martinez Mansell, to map Bourj Al Shamali. From discussions around the potential utility of aerial mapping emerged additional community questions about the relative population density and distribution of resources in different neighborhoods, locations of fire-fighting equipment hubs, and ability to strategically plan future developments. Additionally, community members and Martinez Mansell began to wonder how the mapping process and ownership of a complete map may impact community involvement in camp governance and operations, which are currently under the jurisdiction of the United Nations Relief and Works Agency for Palestine Refugees in the Near East (UNWRA). The Al Houla Association asserted three overarching goals for the community aerial mapping project: to increase visibility through increasing awareness of issues, to create dialogue between community members and working groups, and ultimately to improve conditions through visibility and dialogue. Bourj Al Shamali community members, including community leader Abu Wassim, and Martinez Mansell first set out to use kite mapping kits to take low-altitude, high-resolution aerial images of the whole camp. However, many obstacles such as antennas and electrical wires created physical challenges to kite mapping, resulting in ripped and downed kites. These setbacks did provide opportunity for further community engagement though, as a local seamstress repaired the torn kites and a local carpenter built a more sturdy rig for the camera. Eventually the team also used balloon kits for mapping, but those also had issues with antennas and electrical wires, and two balloons fell victim to the amusement of young men with pebble guns who shot them down. Since the flying was so tenuous, the community members doing mapping canvassed much of the camp on foot in order to find places to deploy the kite or balloon rig, and talked with curious onlookers throughout the camp. The simplicity of the kite and balloon mapping tools set people at ease, and many thought of the experience almost as a game. By the end of the mapping process, almost everyone in Bourj Al Shamali knew about the project and most had seen their peers flying kites and balloons to capture the aerial images. Community members eagerly await the final aerial map, but are using Photoshop offline instead of online MapKnitter to stitch the aerial images together in order to maintain control of the images and project until the map is complete. It is important that the map be locally accessible, to be utilized and shared by the community, rather than existing solely in the cyber world, which is often cumbersome in Bourj Al Shamali. To evaluate whether or not access to an aerial map of the camp has impacted the community in the intended ways -- increasing community involvement in governance, increasing dialogue around community issues, enabling beneficial development within the camp (e.g. of green spaces), etc -- Martinez Mansell will be asking community members to complete a survey questionnaire before receiving maps, and will ask them to complete another survey after a year of having the maps. The surveys will ask questions regarding the person’s use of the map including how often they refer to it, whether or not the distribution of resources in the camp has been altered, and the person’s involvement in various parts of the community. Other factors, including the number of maps printed or downloaded inside and outside of the camp, will also provide insight to the utility of the map. Martinez Mansell is interested in whether or not aerial maps and the community mapping process can be used to provide insight and action steps for a variety of humanitarian issues. Of utmost importance with this project, however, is how well mapping and aerial maps can serve the community of Bourj Al Shamali, and enable the community to create open and green spaces for public health and cultural continuity.